Stages 4 and 5 were all about using stitches to create texture. The first brief was to select drawings from work done earlier in this course, and to think of textural words associated with the image. 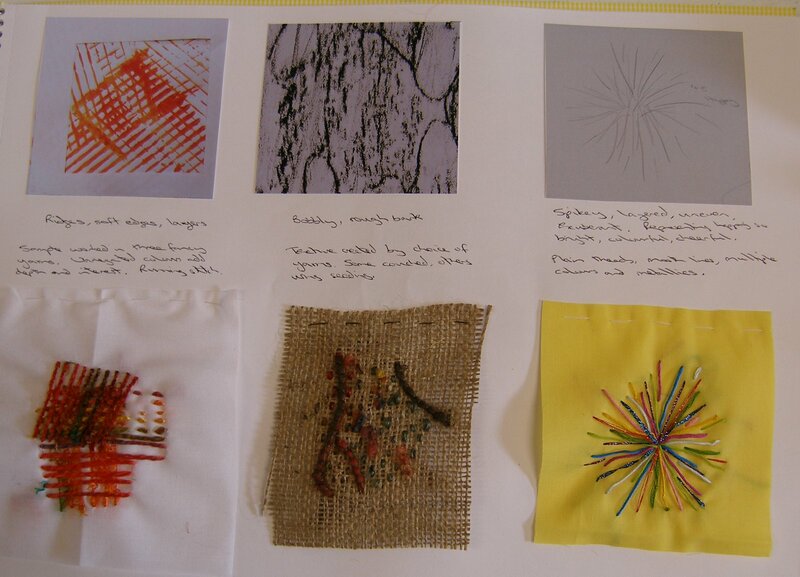 Then to try a small sample using the stitches already explored to match the words and the essence of the drawing. Below left is orange block printing using deck board. Words associated with this are ridges, soft edges and layers. I chose a fancy, slightly fluffy yarn to achieve the soft edges and applied this in broken running stitch and long running stitch layer on layer to achieve the required effect. Middle is a charcoal rubbing of tree bark. This is bobbly and rough so I chose a hessian background fabric. A few different yarns were used in different thicknesses to pick up the varying line width in the bark. The thicker threads were couched and the thinner threads were applied with seeding stitch to produce random bobbles. On the tight is a drawing I did in the very first mark making exercise to represent the word happy. The words I picked for this were spikey, layered, uneven and exuberant. As the picture represents the word happy I chose a bright yellow background and colourful threads with some metallics. The stitching was simple with different lengths of running stitch bursting out from a central point. Below left is scrunched up painted wet wipe and paper. Word chosen were lumpy, ruffled, soft and squishy. I pieced together a couple of different fabrics using blanket stitch and then made large, lumpy and soft French Knots. I only used 3 colours of thread but used two colours in the needle at the same time for some of the stitches to produce more shading in the knots. On the right is a paper collage with acrylic paint. The textures here are smooth, shiny and raised lines. I strip of silk dupion was laid on top of blue fabric to produce the sheen of the smooth, shiny areas. I chose silk threads, again to produce a smooth surface with a sheen. Rows of chain stitch were applied very closely together to form the bands of blue. Metallic thread was stitched in stem stitch on top of the chain stitch for the raised line. I was satisfied with all these samples as I thought they picked up the textures and feelings of each drawing well and that I chose appropriate threads and stitches to produce the different effects. 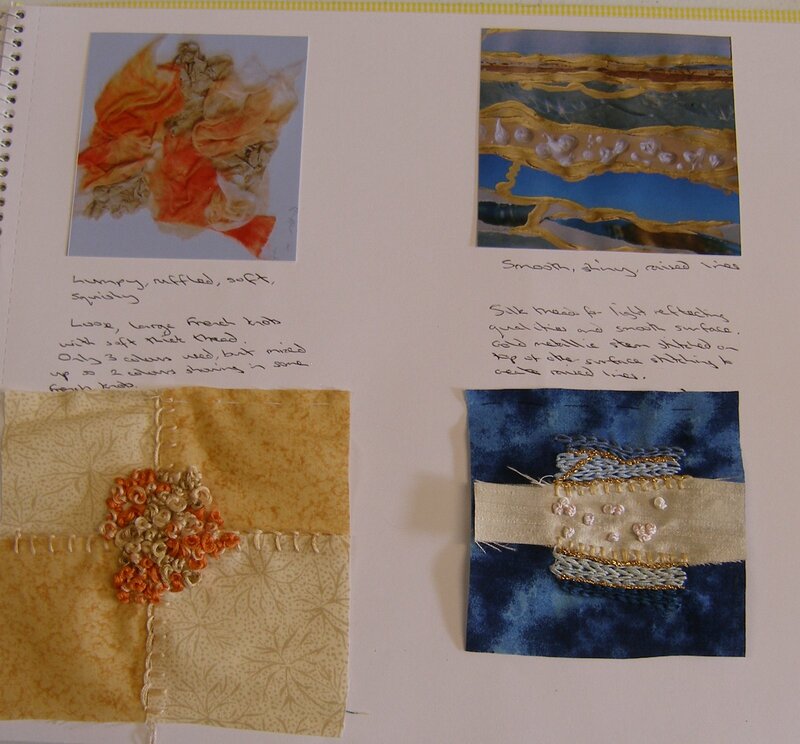 Stage 5 was to create texture using stitches. I did feel that a lot of this stage was repeating previous exercises. I did follow the directions to produce different shading effects using satin stitch and running stitch. 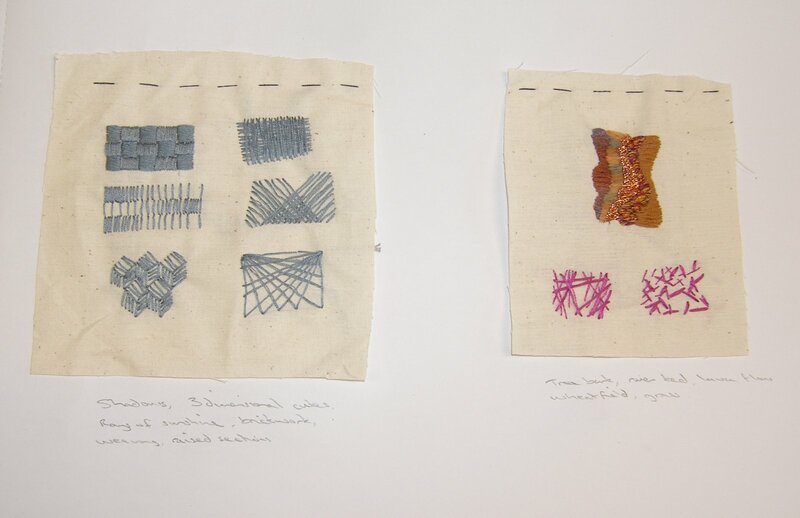 In my samples below the left sample shows a series worked in just one colour, blocking the sating stitch and applying running stitch in different ways. This did achieve some good 3d effects and different ways of shading which could be useful in later work. It was while doing this stage that I saw some Blackwork embroidery and the different shading effects possible with this technique. I have written a separate log entry on this https://tigerctextiles.wordpress.com/2015/03/04/looking-at-blackwork-embroidery/.